This entry was posted on April 25, 2011 at 7:56 pm and is filed under Uncategorized with tags England, Geography. You can follow any responses to this entry through the RSS 2.0 feed. You can leave a response, or trackback from your own site. North starts at Hatfield. This is what the M1 signs tell us. The M1/A1 continues to point to “The North” until you get to Newcastle, where signs start pointing to “Gateshead”, “Morpeth” and so on. There is no more North after that, and apparently Scotland doesn’t even exist. Edinburgh of course is in the South. We are the Sassenachs. Right. Not being that familiar with English roads, I didn’t get the joke in the name of Hatfield and the North for a while. The roads from London “Wales and the West” until they get to Bristol, at which point they just say Wales. So presumably Bristol is where “The West” is located. You are making the mistake of applying logic to a human issue Peter! One of my more treasured posessions is a pre-1973 map of the counties before Ted Heath messed them about. Not really, I’m just winding people up! I have to admit that I hate “Tyne and Wear”. I was born in Newcastle when it was part of Northumberland and didn’t like it at all when we were lumped in one county with Sunderland. I had always presumed it was spelt “Tyne and Way” and that “Wear” was the Geordie pronunciation. The North is a state of mind rather than a geographic location. I hail from Crewe, which is in the North, even though places with higher latitudes (say, Sandbach) are more of the Midlands. I can understand why so many people would like to be in The North, but I’m afraid the facts are against you. Crewe is definitely in the Midlands, along with almost everywhere else in England. I saw a recent analysis of the ‘north-south’ divide based on various indicators such as pay, house prices, schools, etc (excepting geography!). It suggested that the ‘line’ ran pretty much from Bristol, cutting through leicestershire and up to Hull. Wish I could find the link. No, Wirral is definitely the Midlands. We should use the line between the Severn and the Wash, the historic boundary (admittedly a rather fluid one) between Wessex and Mercia. The line between the Mersey and the Humber was pretty much the boundary between Mercia and Northumbria, so the South, Midlands and North are quite nicely defined by those two lines. Yorkshire of course was invented more recently by Geoff Boycott. I’m afraid you’re all wrong. The whole of England is in the north. This is right, there is quite a precise dividing line between North and South, its calles “the equator”. Put a compass rose on your desk with North facing away from you, as is usual. North-West is 45 degrees anticlockwise from that. And, since the rose is a circle, ie, the locus of a point having fixed distance from the centre, the North -West is somewhat south of the North. This is exactly the situation in England, where Manchester is in the North-West yet south of ‘the North’. Sorted? I tried this, but couldn’t find The Midlands on the compass…. The North starts wherever cafeteria workers start calling you ‘me duckie’. Hence, Nottingham. No, Nottingham is most definitely the Midlands. I come from the Midlands (Birmingham) and we considered anyone north of Stoke as a grim northerner. Manchester and Liverpool were definitely north. Anyone south of Stratford-upon-avon was definitely a la-di-da southerner. 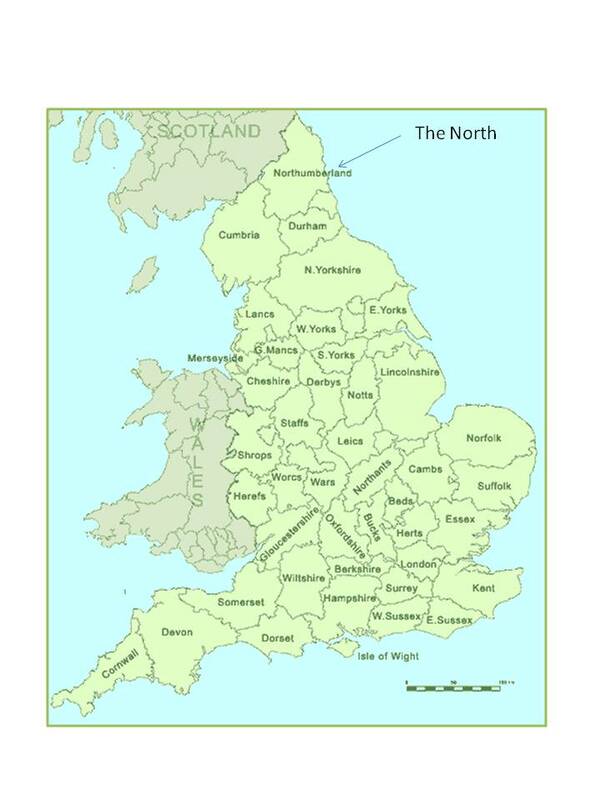 However, the BBC have thought long and hard about where the “North” begins. In days gone by committees were established and reports written. In the recent past focus groups were used and now the BBC pays handsomely a bunch of self-appointed PR experts who tell them what the zietgeist is about the north-south divide and wether it is a geographical concept or a socio-economic one influenced by the BBC’s output over the years of gritty, trouble at pit/mill, what about the workers black and white dramas made by directors who come up from the home counties especially to film them. So, the official position is (synonymous with the BBC’s view, as it should be) is that the north starts somewhere south of Manchester. BBC Midlands today includes, rarely, goings on in Stoke. BBC North West Tonight encompasses manchester, Liverpool, Lancashire, Cumbria and the upstarts on the Isle of Man. Look North covers the North East and Cumbria, Yorkshire, Tyne and Wear. Manchester must be in the north. The BBC has said it will move a large percentage of its programme making to the north and it chose….Salford. The local news programme for Tyneside on BBC TV was – and possibly still is – called Look North. I remember being quite annoyed that they kept covering news from places like Middlesborough. If I remember correctly, where the A64 from York meets the A1(M), the road signs offer you three options: left is “The SOUTH”, right is “The NORTH” and straight ahead is “Leeds”. I conclude that Leeds, being neither in the North nor the South, must be on the dividing line between the two. Also, viewed from Yorkshire, the Midlands do not seem to exist – they appear to be a subset of the South. The discussions here remind me of how readily people disagree. A long time ago I was in the junior section of the National Cactus and Succulent Society, but then let membership lapse. When I looked again at the cactus world in the 1990s I was astonished to find that the NCSS had split into two a long time before. In fairness I could see the two sides clearly enough even as a teenager: those who wanted it to be a social club, and those who saw it as an academic society. The magazine had articles that fell very clearly on each side of the divide. But people will disagree about ANYTHING! The North is where Rugby League is played, surely? Your “North” is some sort of wilderness lying between Scotland and the actual North, I think. Rugby League is only played in the Midlands. Rugby league is played in the South, Northerners are too soft. As the results of recent Rugby League world cups show. Best way to tell if you are oop norf. Nobody who’s ever seen the glory of Northumberland would ever say it’s grim up North. It’s the Midlands that’s grim. So many things wrong with the post and the comments. As a Brummie married to somebody from Lancashire (via Canada), it has always been perfectly clear to me that the dividing line between the Midlands and the North is where people start talking to you on the street and calling you ‘Love’ on the bus – somewhere between Birmingham and Manchester. As for places like Newcastle, I always assumed they were part of Scotland. As a Cornishman, we refer to everything beyond the Tamar as the North, or rather ‘up country’. Slight issue here – I am Cumbrian and would most definitely class myself as northern – your map would also suggest I am very much northern, although not from the north east (thank god, as that is almost worse than being southern). However, I am inclined to believe that you will tell me I am from the midlands just to prove a point. If you look at the map you’ll see that the “North East” is actually The North, although it is North East of Cumbria, which must therefore be the South West. Tongue out of cheek, I totally agree that the North is wonderful, but then so is Birmingham and the Black Country. “Earth hath not anything to show more fair” – Lines composed on Westminster Bridge (by Wordsworth), 1802.